The house of Lora & Festa dates back to 1885 and is rare in its unique quality and unbroken family heritage for over 4 generations. is one of the leading purchasers of cashmere globally. a vertical wool mill in 1885 known as Fratelli Lora. By 1917 it was converted into a worsted spinning mill processing imported wool to supply yarn to the Italian domestic market. Then in1926 the company become known as Lora & Festa, headed by Ottavio's son Alfredo Lora and brother in law Giacomino Festa Bianchet. After WW2, the next generation of Lora & Festa took the helm, led by Giacomino’s son Ottavio Festa Bianchet, andexpanded into continental Europe. While investing in new machinery, adapting to evolving customer tastes, Lora & Festa became an Italian SpA. The 4th generation saw the emergence of Giacomo Festa Bianchet in the 1970’s and Edoardo Festa Bianchet in the 1990’s with an entry into the world’s luxury markets. In 2001, Edoardo established Lora & Festa in Hong Kong and lay the foundations for a global business platform out of Asia for the Lora & Festa brand. An avant-garde cashmere collection, NanocashmereTM, blends a refined and luxurious style with cutting edge technology. and breathability, delivering long-term results. and cleansing properties of certain plants. Lora & Festa NanocashmereTM is for people who enjoy outdoor activities, such as golf, sailing, skiing, and are looking for protection and comfort without renouncing style. Lora & Festa Nanocashmere™ modifies cashmere at the molecular level by attaching hydrophobic nano-structures to individual fibers that elevate liquids, causing them to bead and roll right off the knitted surface. 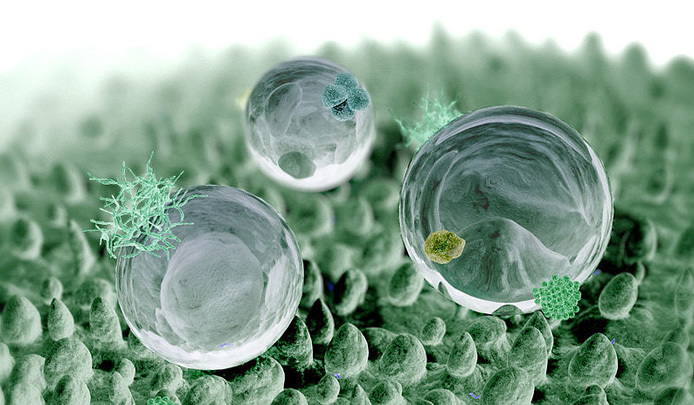 The technology works on the nano scale - that is, on the molecular level - to protect each cashmere fiber Lora & Festa Nanocashmere™ repellent technology is inspired from the water repellency and self-cleaning behaviours of certain plants in nature. Hand wash gently in tepid water with neutral soap or dryclean with proper solvents. pressing with steam before washing. Dry at low temperature 40°max. Do not rub spin. Flat drying is recommended It is necessary to make specific trials on own knits, as the final result always depends on type of knitting machine used and stitch density. A technical data sheet with all the related instruction is available on request. Nm. 2/27.000 - 1 ply 12 gauge, flat machines - cotton 21/24 gg. All Stock Service colours can be chosen from Newcashmere Colour Cards without surcharge. Due to our highly innovative nanotechnology cashmere treatment, colours may have slight variations in tone which should be taken into account during the sampling process. Nm. 7.000 - 1 ply 8 gauge, flat machines - cotton 12/15 gg. All Stock Service colours can be chosen from Maestro Colour Card, without surcharge. Due to our highly innovative nanotechnology cashmere treatment, colours may have slight variations in tone which should be taken into account during the sampling process. Optimal dye/batches solid colours: kg. 3 - 5 - 10 - 20 with surcharge. The agreement signed with Lora & Festa was born from the same achievement of goals, values and traditions. are the basis on which the two companies will intertwine in the presently and going forward. will help to complete the wide range of exclusive yarns in the LUXURY COLLECTION presented by Tollegno 1900.